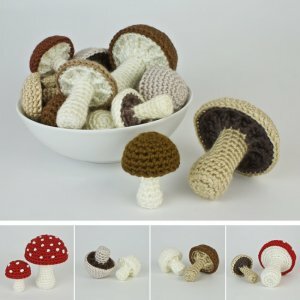 This listing is for 2 original crochet patterns (Mushroom Collection - a set of 6 patterns - and Mushroom Variations - 4 options to apply to any of the Mushroom Collection patterns) by June Gilbank. Mushroom Collection includes 6 different realistic mushroom designs (3 domed and 3 flat), perfectly shaped, with gills hidden under the caps and a crisp colour change between cap and gills. All the mushrooms in this collection use the same techniques, so once you've learnt them with your first mushroom, you'll be able to whip up more in no time! Choose the shapes and sizes you prefer, or create a mixed arrangement in a variety of shades of white and brown. Pile them in a bowl, arrange them on a window ledge, or add them to a seasonal centrepiece or wreath. Short Stem: Especially good for play food – these mushrooms look good enough to eat. No-Sew: A speedy crocheted alternative to the standard needle-stitched finish. No Gills: A quick and easy option – great if you want to whip up a large batch of mushrooms in a hurry.